The presence of water supply protection lands and restrictions on internal combustion engines make West Waushacum Lake is an ideal location for paddle boat fishing. Those fishing in spring and early summer will find stocked trout in abundance. Bluegill, Pumpkinseed, Chain Pickerel, and Largemouth Bass are also abundant with the occasional larger fish. White Perch and Smallmouth Bass are present but in much lower abundance. West Waushacum Pond has produced Smallmouth Bass, Chain Pickerel, Black Crappie, White Perch, and Rainbow Trout that meet minimum sizes for recognition by the Freshwater Sportfishing Awards Program. 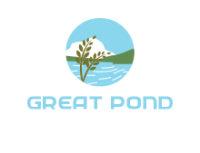 12 species : Largemouth Bass, Smallmouth Bass, Chain Pickerel, Black Crappie, Yellow Perch, White Perch, Bluegill, Pumpkinseed, Yellow Bullhead, Brown Bullhead, and Golden Shiner. West Waushacum Pond is also stocked each spring with trout. Car top dirt ramp launch alongside road. No motors. There is roadside parking only at the launch. 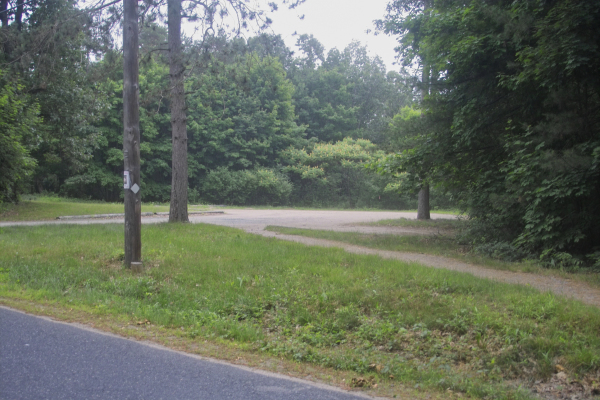 If you go a short distance to the gravel parking lot for the Central Mass Rail Trail across the street from the pond. 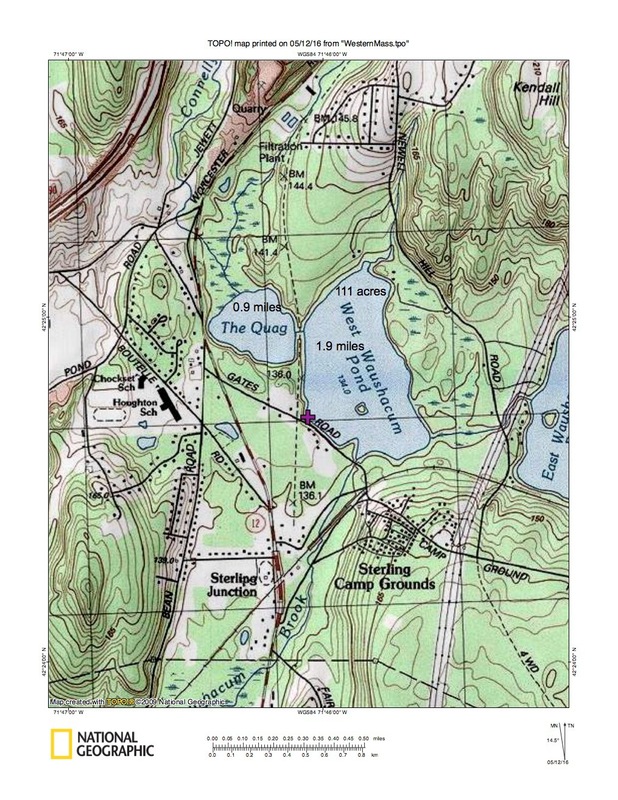 At mile 1.7, in the middle of Sterling, continue straight onto Route12 South/Route 62 West. At mile 2.0, turn slight left onto Route 12 South. ​At mile 3.8, turn left onto Gates Road. At mile 4.0, park roadside and launch car top boats just about 25 yards down on the opposite side. 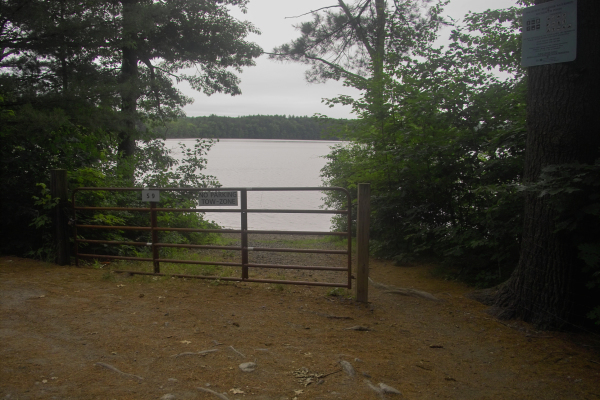 Gravel Launch for car top,kayak, canoe, and electric motors permitted. You can use this rail trail parking if needed. 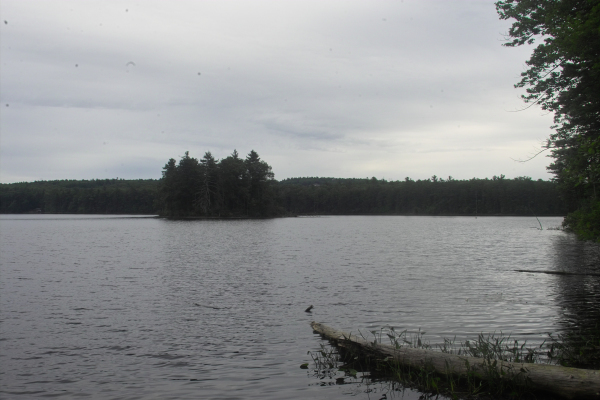 A view of the pond and island on a rainy day.